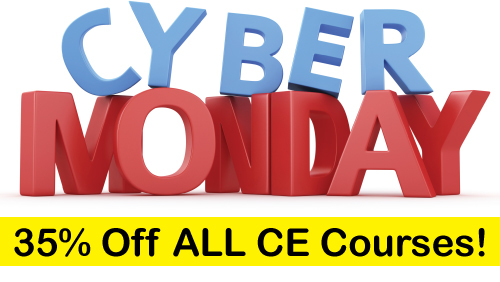 Save 35% on all online continuing education (CE/CEU) courses right now @ PDR during our Cyber Monday CE Sale. ALL courses are included: online, video, test-only, sale, closeout, etc. ALL COURSES ARE 35% OFF. There’s never been a better time to stock up on CE for your next license renewal. Not sure what your requirements are? Click here to find out. This entry was posted in Counseling CE, Marriage & Family Therapy CE, Nutrition & Dietetics CE, Occupational Therapy CEUs, Promotions, Psychology CE, School Psychology CE, Social Work CE, Speech-Language Pathology CEUs, Teaching CE and tagged CE sale, ceu sale, cyber monday, Cyber Monday CE Sale, License Renewal, Online Courses, Professional Development Resources by Gina Gunderson. Bookmark the permalink.